Is Wilder Vaughn the Black Major? <SPOILERS>- BLOOD FOR THE BARON!!! 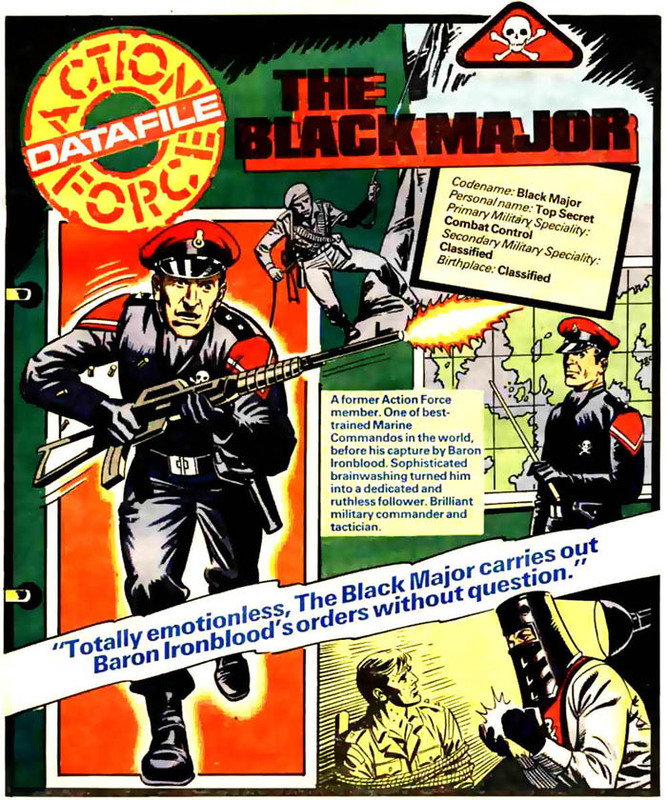 The Black Major's origin story is an epic tale. Following his school days through his bootneck career to his enrolment in Action Force, John Shepherd's mean streak and competitive edge are evident from the start, he gradually develops into a ruthless murderer. This dark tale paves the way to his downfall when he is captured by Baron Ironblood's Red Shadows. He is broken by the Baron's mind control and reduced to a mere puppet. Utterly compelling. The Black Major's service in the Red Shadow movement is a bloody chapter indeed. Completely merciless, the Baron's attack dog turns his Action Force training against his former comrades time and again. His loyalty to The Baron is absolute. Assault on Atoll Z is a fierce struggle for supremacy in the South Pacific. The Black Major and Red Laser lead a contingent of Red Shadows against a Z Force outpost. The battle rages in the midst of Hurricane Yola culminating in the Major and Laser being swept out to sea on a tidal wave. While not being featured in the world-changing events of "World Enemy No. 1", the Black Majors life is forever altered by this classic story. Baron Ironblood betrays his Red Shadow minions to Action Force and vanishes without trace. Red Jackal survives the onslaught and vows revenge on Ironblood. He too is a former Action Force operative turned by The Baron's brainwashing programme. Baron Ironblood changes his identity to that of the Cobra Commander and recruits an army of mercenaries. Red Jackal tracks him to his lair and moves to destroy him. He fails, and is mockingly remoulded as Destro. The Cobra movement is born. After months as castaways the Major and Red Laser return to civilization. Quickly gathering the tattered remnants of the Red Shadows together they set out to renew their struggle against Action Force, as well as the forces of Cobra. Cornering Cobra Commander on the battlefield, the Major is horrified to discover the truth. He drops his guard and is lost. From the ashes of defeat the Black Major returns, more bloodthirsty than ever. He has sworn revenge on his betrayer and former master, Baron Ironblood AKA Cobra Commander. In the midst of his crusade an encounter with Destro leads to a secret agreement between the two of them to kill Cobra Commander. He sacrifices the bulk of his army to steal a fortune in South American valuables. A new Red Shadow movement rises to challenge both GI Joe and Cobra alike. Led by the mysterious Wilder Vaughn, could he be an older John Shepherd? I say hell ya he should be! This is what I am hoping and have been hoping and suspecting since his introduction. If Vaugh turns out to be the Black Major then he has just became even more interesting now to me. and he was interesting to me before !!! his connection to Joseph Colton , thats why! Vaughs whole connection to JOESEPH COLTON,the very first GI JOE, makes both characters so much cooler. Location: Looking for a new base of operations. This could bridge the gap between Action Force and GI Joe. It would also bring up the questions about what happened to the rest of Action Force and who was the other Cobra Commander? THE SHADOWS WILL RISE AGAIN!!! BLACKMAJOR666 wrote: .......... It would also bring up the questions about what happened to the rest of Action Force and who was the other Cobra Commander? and thats what I been talking about people!!!!!! we slowly get these characters back then people will want to check out these old comics and then they will start looking into all of these other characters and wanting them back too! BLACKMAJOR666 wrote: This could bridge the gap between Action Force and GI Joe. I would very much like to see Captain Buckingham, Jonesy, Muller and Beaver of SAS Force return as well! The rest of the Action Force squad characters were less memorable but those guys were really fleshed-out. Has there ever been a Breaker: Declassified story? Is there any reason why he and Breaker from Z Force can't be one and the same? The American Breaker died in the comics in the early 90's. Could he not have been in Z Force before he joined GI Joe?